in the US and the end of the spring break, it’s a good time to look at campus maps and how students are getting around these days. As universities continue to grow, finding the location of a class is becoming more difficult. Fortunately for today’s students, our Geo APIs can help make campus navigation a lot easier. 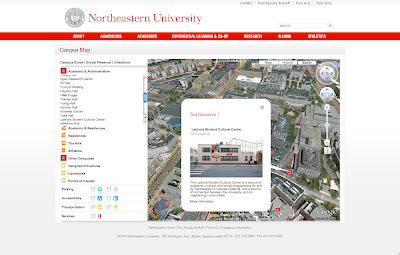 Northeastern University’s campus map is great example of a highly immersive Google Maps and Earth experience. Using the Google Earth Plug-in, users can ‘fly’ in animated 3D from one building to another. The entire campus is custom modeled in 3D (which can easily be done using Google SketchUp). The map also features custom icons, integrated directions, custom balloons with pictures, and even a page where users can see the locations of Northeastern students studying abroad. This map is a great example of a seamless custom imagery overlay on top of the Google Maps baselayer. 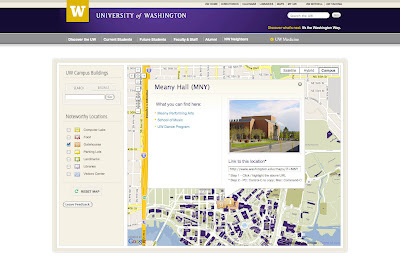 Buildings on the custom UW map are clickable and clicking on one of the buildings brings up a custom styled info window with links to departments held within the building. UW also provides a shortened URL for the building for easy sharing. 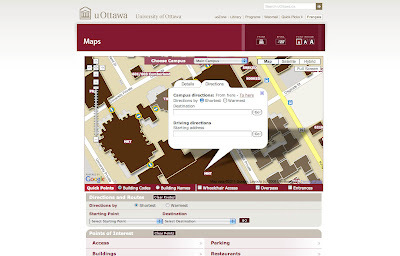 On the left hand side of the map there is a navigation bar for noteworthy locations such as computer labs, parking, or libraries. Selecting one of the categories will populate the map with a corresponding custom icon. Extra credit points for a custom styled and easy to use UI, both in and around the map. Going to school at the University of Ottawa presents some unique challenges, namely that it can get really cold in the winter. According to the City of Ottawa’s visitors site, the average temperature in January is -10 degrees Celsius! This map aims to make life easier for students by providing integrated direction with two options: shortest route and warmest route. Buildings at uOttawa are interconnected, so students can choose to go between buildings or to brave the cold outside. This map also features custom overlays, custom icons showing the locations of overpasses, and custom info windows. Waiting on your bus can sometimes be huge time sink, which is especially troublesome if you happen to be in the middle of finals. 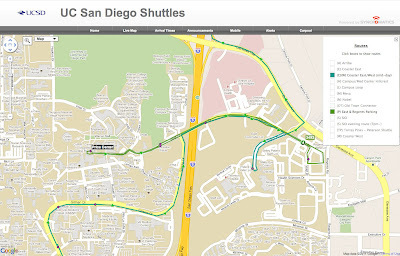 The University of California - San Diego has taken the guess work out of campus transportation by tracking the real time location of all their shuttles on a Google Map. Using the map above, students can see route maps, travel times, and shuttle locations. There’s also an integrated trip planner to help students get around the greater San Diego area. 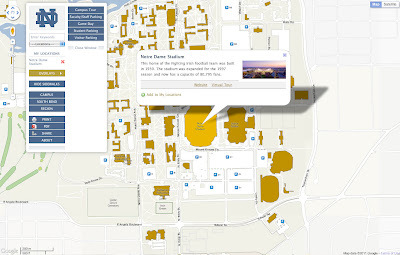 In addition to being a great looking and easy to use full screen map, the University of Notre Dame has added filtering tools to highlight the relevancy of certain buildings at a given time. For example, clicking on the “Game Day” overlay button will highlight Notre Dame stadium (where the games are played) and Bond Hall (where the marching band plays traditional game day concerts), as well as a few other buildings active on game day. Amid the height of “March Madness” from the NCAA basketball tournament in the US and the end of the spring break, it’s a good time to look at campus maps and how students are getting around these days. As universities continue to grow, finding the location of a class is becoming more difficult. Fortunately for today’s students, our Geo APIs can help make campus navigation a lot easier.